Malta enjoys one of the highest numbers of sunshine hours on the continent – an impressive average of 3,000 sunny hours per year. Just before World War II, large tracts of arable land at Ta' Qali, near Mosta, were taken over to build a military aerodrome and an R.A.F. Station. This military zone has now been closed for many years. Several buildings and hissen huts have been converted into small workshops and souvenir boutiques, to create what is now the Ta' Qali Handicrafts Village. Just before World War II, large tracts of arable land at Ta' Qali, near Mosta, were taken over to build a military aerodrome and an R.A.F. Station. This military zone has now been closed for many years. 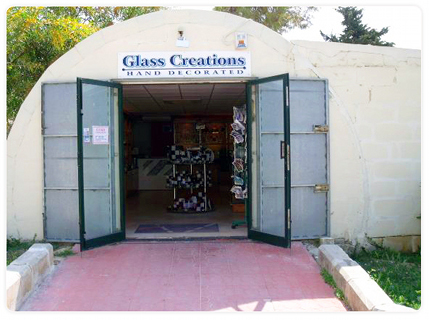 Several buildings and hissen huts have been converted into small workshops and souvenir boutiques, to create what is now the Ta' Qali Handicrafts Village. The Village is a big attraction for tourists who can see Maltese craftsmen at work and view the product of their handiwork. Blown glass, gold, silver and filigree ware, ceramics, ironwork, knitwear, and other goods are on sale at the souvenir outlets in this handicraft centre. The remaining land at Ta' Qali is at present being converted into a National Park and a sports centre. The National Football Stadium, a Greek Theatre and large pavilions for indoor sports are already available. The green park area is frequented by hundreds of families whose children can play in the ample space during sunny days in winter and spring-time.